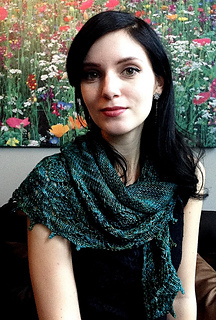 Raven’s Nest Shawl was inspired by the landscapes and mythology of the beautiful west coast of Canada. The raven is a cultural focus that symbolizes creation, knowledge, nature and truth in all things. The raven is a healer and a keeper of secrets. 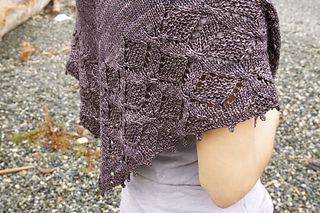 Raven’s Nest is a triangular shawl featuring top down construction which is easily adjustable to any size. It features a few cable crosses and an easy lace stitch for lovely overall texture. 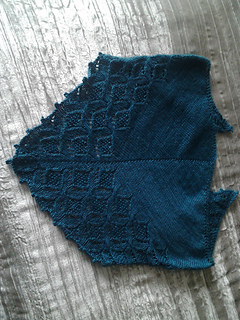 The sample shown was knit using approx. 500 yds of the yarn. 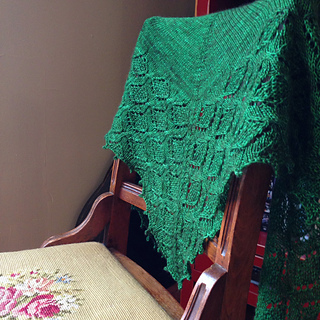 Thank you to Teresa (innersparkle) for test knitting this pattern for me. When working from the chart, all sts are represented, including the edge sts and the center st. The 2 edges at each end of the chart should be worked in garter stitch, not stocking stitch, as the chart shows. 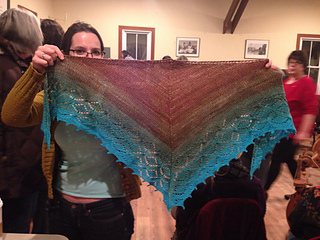 The shawl is made up of two sides separated by the center spine st. The written instructions to the chart represent one half of the shawl sts and do not include the edge sts or the center st. The four edge sts (2 sts at each end of every row) are worked in garter st throughout and the center spine st is worked in stocking st throughout. For example, row 1 is worked as follows: K2 (edge sts), work pattern row, K1 (center spine st), work pattern row again, K2 (edge sts). When working from the written instruction to the charts, the text in brackets indicate the st pattern repeat. When following the written instructions to the chart continue to work the increases as est in the St st section. The Inc noted in the written instructions to the chart is to be worked as follows depending upon the position of the Inc in the row: at the beginning of the row work as a yo; before the center spine st work as a RL1; after the center spine st work as a LL1; at the end of the row work as a yo. Cable Twists noted in the written instruction to the charts: all cable twists worked before the center spine st are 2/3 RPC; all cable twists worked after the center spine st are 2/3 LPC. Anyone needing further help or clarification on any of the above errata or if you have a question on the pattern, please send me pm on Ravelry here and I would be happy to help.